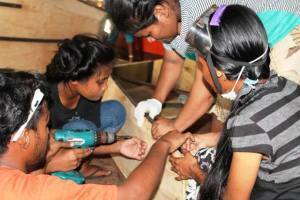 The Waan Aelõñ in Majel Program uses the mediums of canoe and boat building, life skills counseling, and classroom techniques to give its trainees a chance at achieving success in their lives and those of their families. On a national level, this means WAM is directly contributing to cultural and economic development, national unity and self-identity. On an individual level, the program gives the youth traditional and modern sustainable skills, enabling them employment and income generation. While doing this, WAM – which is a drug and alcohol free program — raises public awareness about the difficulties faced by many youth in the Marshall Islands. To achieve its goals, WAM has established partnerships with agencies of the Marshall Islands national government, especially the RMI National Training Council, and various non-government sectors that have an interest in promoting sustainable economic development. WAM runs three-month and six-month courses. A month or so prior to each course, WAM promotes male and female youth to come and fill in applications. These are then vetted and the required number of trainees (usually about 25) are signed on. Learning about Marshallese legends, proverbs, and Marshallese chants and how they relate to traditional canoes and sea life. Holding of a special graduation ceremony, with the top trainee giving a speech of appreciation.